We are pleased to announce AdPortal Online, AdSystem’s new online ad portal for collecting ad materials. 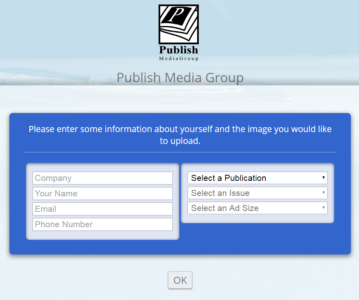 This new module for AdSystem Online provides a website where customers can upload their ad materials directly. AdPortal Online simplifies and automates the process of collecting, processing and organizing ads. 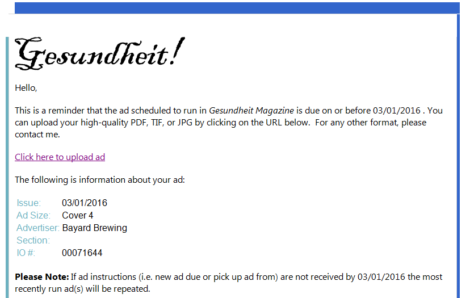 You can send emails to your customers requesting their ad materials, either individually or in a batch. Emails can include a link to the AdPortal website, where customers can upload their ad materials. A website branded with your name and logo where your advertisers can upload ads in any digital format. After materials are uploaded, confirmation emails are sent to the advertiser as well as to selected people in your office, including the sales rep and production person. Ad materials are attached to the ad order in AdSystem, and a thumbnail image is generated. The ad’s production status is updated to show that materials are received. Other production stages, such as proofreading and preflighting may also be triggered automatically. You can optionally have the ad materials relayed to your FTP server. Without a slow upload speed you are instantly connected without any wait. 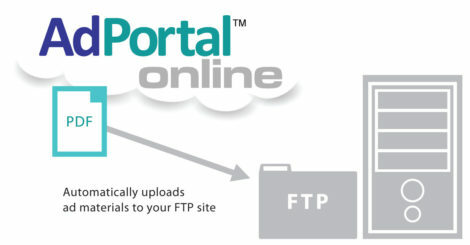 When your ad materials are uploaded onto your Publishing Branded Website from your advertising customers via AdPortal, those materials will automatically be on your FTP Server. It’s that fast and simple. AdPortal Online is branded with your name and logo. 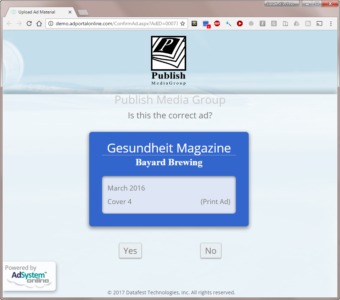 When your customers go to AdPortal Online, they see your logo and can select from among your publications. You can even link to the AdPortal website from your website, providing easy access for your advertisers. Advertisers can also submit ads to the website independent of any emailed request. That means they can bookmark the AdPortal website and submit ads any time they wish. When they submit ads, you will be notified.